Recipe from "Big Green Egg"
1. Prepare your Big Green Egg for an indirect cook with the convEGGtor (indirect setup) at a temperature of 275°F/135°C. Heavier smoking wood chunks are recommended for this cook, such as oak, hickory, mesquite, or pecan. 2. Trim the excess fat and silver skin from the brisket. Also, remove any “hard” pieces of fat as they will not render off during the cooking process. Trim the fat off the bottom of the brisket leaving only1/4" (6 mm) fat. 3. A brisket is comprised of two muscles; the point (the fat end) and the flat (the lean end). 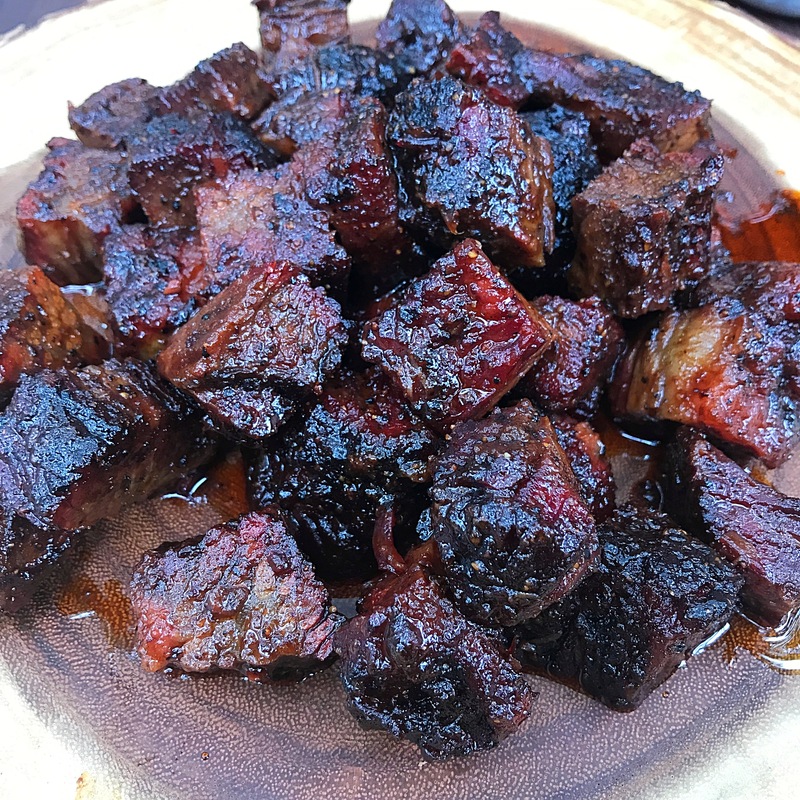 In order to be able to cook brisket burnt ends you need to butcher the brisket a bit more than you would for a traditional packer. Therefore, after your traditional brisket butchering, you need to start to separate the flat from the point. Using a sharp boning knife expose the point meat so it can absorb smoke. You don’t have to completely separate the muscles. (See photo for example). 4. Place the brisket in the EGG fat-side down. 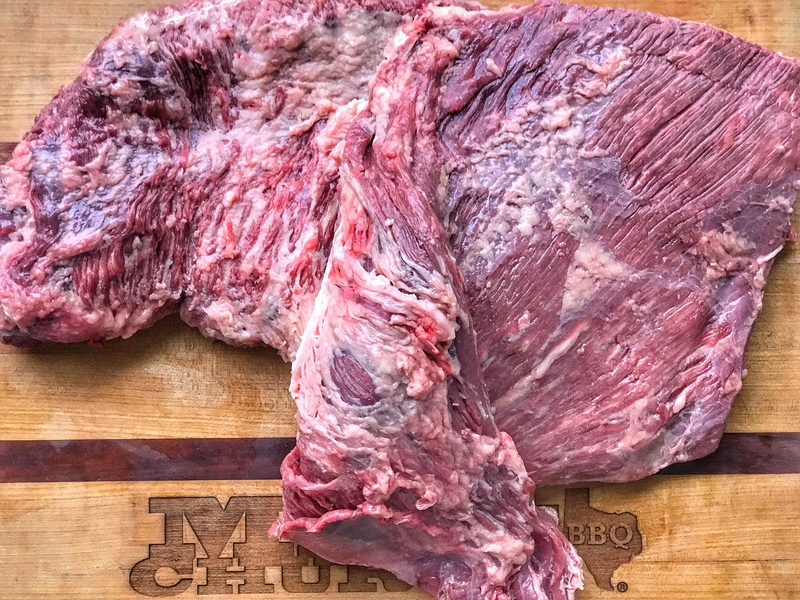 When the meat reaches an internal temperature of 160°F/71°C, double wrap the brisket in non-waxed butcher paper or aluminum foil…this is what we call the Texas crutch. The bark will have formed nicely by this point. 5. Continue to smoke the brisket until it reaches an internal temperature of 195°F/91°C. The brisket is not completely done at this point but we need to separate the point to make burnt ends. Unwrap the brisket and separate the point from the flat. Re-wrap the flat and return it to your Big Green Egg. Continue to smoke it until the meat is “probe tender” which means when you probe it with an instant-read thermometer there is no resistance. Think of a toothpick in a cake. Each piece of meat is different but this will likely be between an internal temperature around 203° F/95°C. Rest your brisket flat in a cooler for at least one hour. 6. Take the point and cut it into 1” cubes. Place the cubes in the aluminum pan. 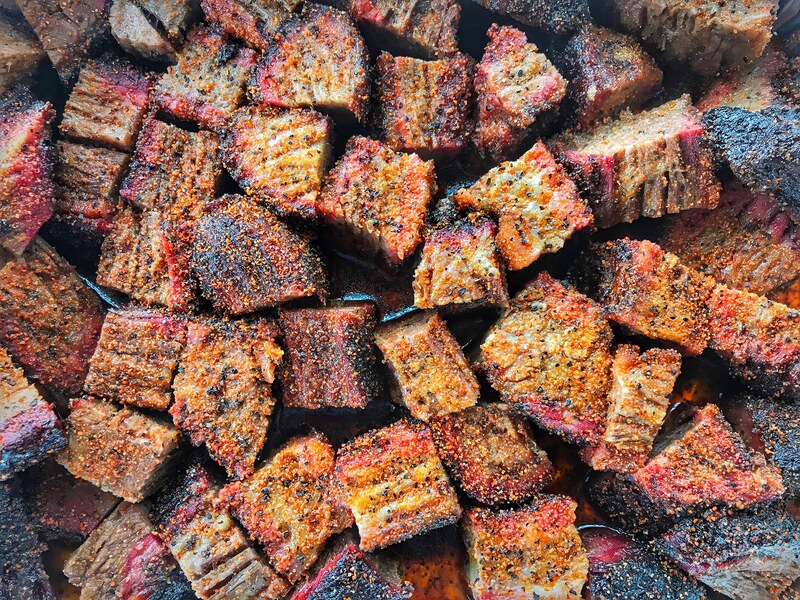 Season and toss the cubes with more Meat Church Holy Cow (or your favorite BBQ rub spices). Cover the cubes with Big Green Egg Kansas City Style Sweet & Smoky BBQ sauce. Drizzle honey across the top. Finally, toss the cubes thoroughly to ensure they are completely covered. Return the pan to the Big Green Egg and cook for another 1 – 2 hours or until all liquid has reduced and caramelized. 7. Allow to cool for a few minutes and enjoy immediately!